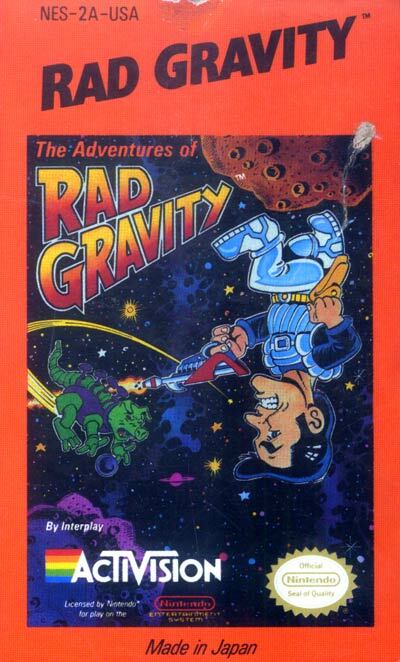 The Adventures of Rad Gravity was a game for the Nintendo Entertainment System published by Activision in 1990. It was developed by Interplay Productions. The game was a platformer with a wacky storyline in which the eponymous main character explored multiple planets and fought enemies while jumping through levels. The game was notable for a level in which the protagonist was drawn upside down and gravity was reversed. The main character had a comically large head, and his early game attack consists of a sort of a lightsaber.